A tractor-trailer that came up behind an unexpectedly slow driver in torrential rain may have been the cause of a massive pileup on 1-10. The recent truck accident occurred on the highway near the Monroe Street intersection. Based on their preliminary investigation, police believe that the tractor-trailer tried to stop to avoid hitting the slower car and swerved on the slippery roadway, causing the truck to jackknife. The resulting 45-vehicle pile-up, including 5 semi-trucks, injured 8 people including one in critical condition. Jackknifing is a dangerous situation when a tractor-trailer skids and the trailer swings out to one side. A truck will jackknife when its wheels lock up because of wet or slippery conditions. The tractor and its trailer then form an angle that resembles an open jackknife with its protective handle. If the jackknifing occurs when the truck is moving at high speed, a rollover may occur. While jackknifing, the trailer can hit other cars while swinging out and may extend over more than one lane of traffic. Tractor-trailers are usually loaded with thousands of pounds of cargos, making them significantly larger and heavier than other vehicles involved in an accident. If the truck overturns, it may potentially spill its cargo with a serious risk of fire. 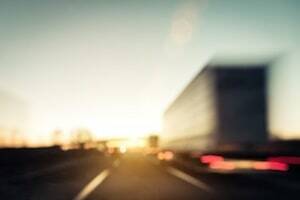 A victim of a jackknife accident or any other truck crash may face significant medical hurdles and financial challenges. Ongoing expenses such as medical, rehabilitation, physical therapy, current and future lost wages, home and vehicle alterations and pain and suffering can put a significant financial burden on the victim and his family. Can a Motorist Avoid a Jackknifed Tractor-Trailer? Certainly many accidents are not avoidable, for example when the truck driver must respond to a sudden hazard. But driving prudently and keeping lots of space between your vehicle and the truck ahead can reduce your risk of being involved in this type of accident.